1. Conserve. According to the EPA’s Energy Star program, vampire power accounts for more than $10 billion per year in energy costs. While “vampire power” might sound like the latest anemic thriller from Hollywood, the term actually refers to the energy some devices use, when they are switched off but still plugged in. 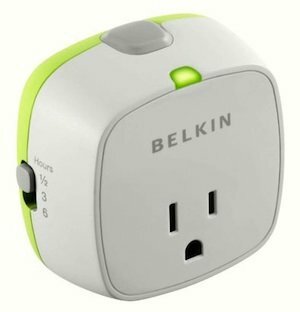 Belkin’s Conserve Socket helps battle the electricity-suckers in a simple and easy-to-use way (that doesn’t involve garlic). Simply plug one of these $10 devices into the wall, set the switch to one-half, three, or six hours, and press the start button. The socket shuts off all power after the programmed time. In addition to vanquishing vampire power drain, Conserve works great for an air conditioner or fan you don’t need to run all night, or for a curling iron or coffeemaker you’re afraid you might forget to turn off in the morning. In other words, both energy and stress are saved. 2. SafePlug. Though it’s a more costly and labor-intensive option, SafePlug has additional features that make it worth a look. Initially, the product developers were driven to create a power outlet that would stop fires caused by appliances and other electrical devices. Their research showed that the circuit-breaker systems in most homes do little to prevent fires triggered by overloaded outlets. Thus, the SafePlug system moves the protection of a breaker directly to the wall. Most home DIYers can probably handle its installation. 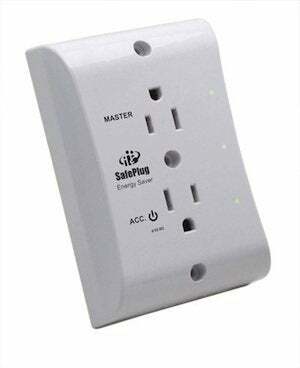 Setup involves replacing the wall outlet, plus installing a small “tag” in the plug of any device plugged into that outlet. SafePlug instantly cuts power if something goes wrong, and it also prevents kids from getting shocks and burns if they insert something like a paper clip or metal toy. 3. Smart Strip. 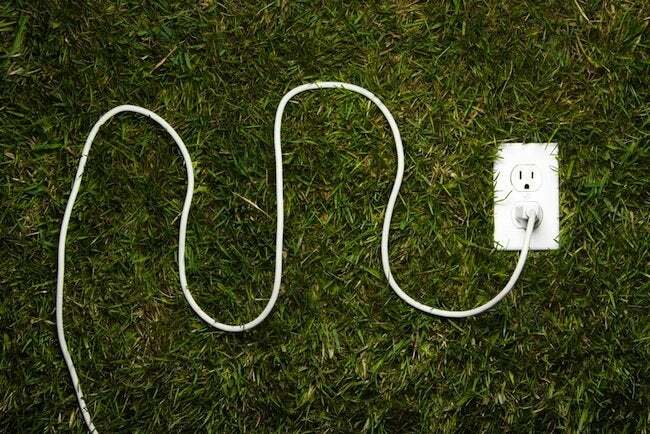 This well-named power strip delivers a unique approach to saving energy. Plug a main device, such as a TV or computer, into the blue outlet on the strip, then plug peripheral devices like printers, speakers, and receivers into the strip’s “switched outlets.” When you turn off the main device, the strip automatically cuts power to the peripherals. The Smart Strip includes three “hot” outlets for plugging in devices you want continuously powered. In addition, a substantial 2,225 joules of surge protection are provided. 4. 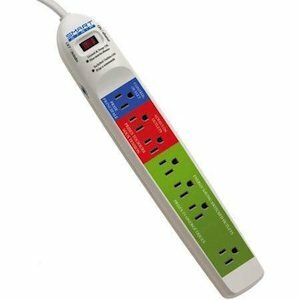 360 Electrical Rotating Surge Protector. If you’ve ever faced the frustration of not being able to fit two bulky plugs into a standard outlet at once, this is the device for you. 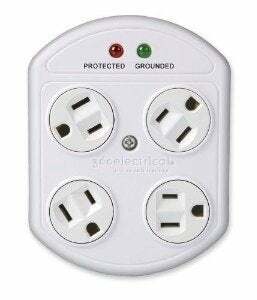 Simply plug it into any wall outlet and it provides four grounded (three-prong) outlets that swivel a full 360 degrees. That means you can rotate a plug until it plays nicely with the other plugs around it. The outlet also acts as a surge protector. Do you travel a lot? Be sure to check out the company’s Mobile Surge Protector, which turns typical hotel-room outlets into “revolutionary” wonders with two sockets and two USB-charging slots. 5. 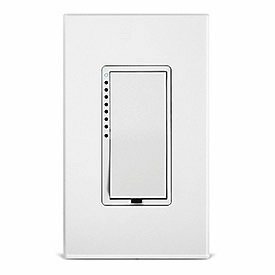 Insteon Remote Control Dimmer. Insteon manufactures two outlets that create instant mood lighting. One is a plug-in module, and the other is a replacement outlet you wire directly into the wall. Both let you plug in any lamp with a load up to 300 watts, which you can then dim to 32 different brightness levels using any Insteon remote control. It’ll let you see your surroundings in a whole new light!